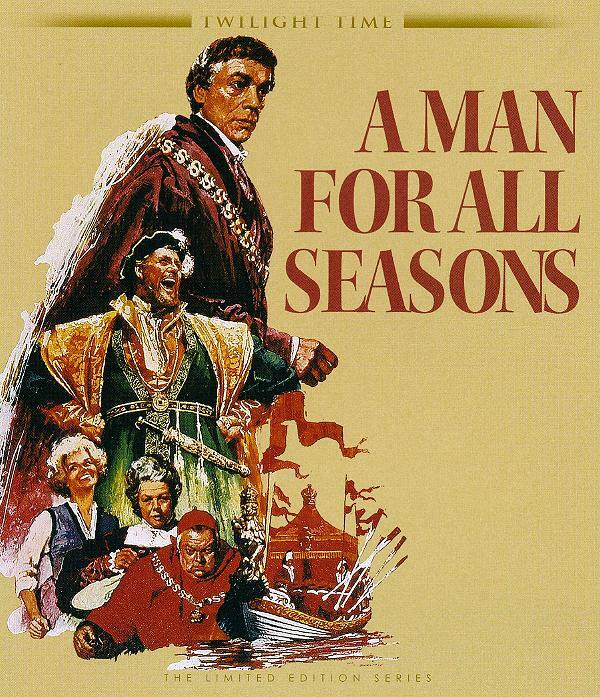 A Man for All Seasons won the 1966 Oscars for Best Picture, Best Actor (Paul Scofield), Best Director, Best Adapted Screenplay, Best Cinematography, etc. I saw it in a theater in Janesville, Wisconsin, and then enthusiastically recommended it to anyone who would listen. A member of the college-age youth group at church went to see it and was disappointed – nothing but people talking, he said. But that was one of the best things about the film, the talking, the dialogue. Robert Bolt adapted the screenplay from his very successful play, also starring Paul Scofield. The cast was perfect: Robert Shaw as Henry VIII, Orson Welles as Cardinal Wolsey, Leo McKern as Thomas Cromwell, Richard Rich played by John Hurt, etc. I bought records that included all of the dialogue and listened over and over. Eventually I could recite all the best bits without having consciously engaged in memorization..
Roper: Now you give the Devil benefit of law! More: Yes, what would you do? Cut a road through the law to get after the Devil? Roper: Yes. I'd cut down every law in England to do that. More: And when the last law was down, and the Devil turned on you where would you hide, Roper, the laws all being flat? This country is planted with laws from coast to coast... Man's laws, not God's, and if you cut them down, and you're just the man to do it, do you really think you could stand upright in the wind that would blow then? Yes. I give the Devil benefit of law for my own safety's sake. As soon as there was home video I purchased a copy, first for Betamax, then for VHS, then a DVD, and now, finally, Blu-ray. It has taken this long for it to be released on Blu-ray. My copy arrived today. The Blu-ray version has been released by Twilight Time. Twilight Time does limited releases of only 5,000 copies, and does them beautifully, but charges $29.95, considerably more than one would ordinarily expect to pay for a DVD these days (but far less than I paid for that original Betamax version). It is worth it to me. I recommend the film today just as much as I did in 1966 – enthusiastically, even if it is just a lot of talk. Amazon sells the DVDs and the film can also be purchased on Amazon Instant Video. The Twilight Time Blu-ray version can only be purchased at www.screenarchives.com.